For all those who were waiting for, here are the essential reissues of the magic and long out-of-print “Elemental Severance” (originally released on Cold Meat Industry back in 1995) and “Atom Xtension” (out in a micro-pressing of only 100 copies) albums gathered in a double CD package enriched with 5 bonus tracks! An amazing chapter of the glorious Swedish sound of the mid-90’s is here and in full splendour! Pure nordic genius, Peter Andersson is the talented man behind Raison D’être and a number of brilliant musical projects like Stratvm Terror and Necrophorous, each one with a very impressive and distinctive sound. 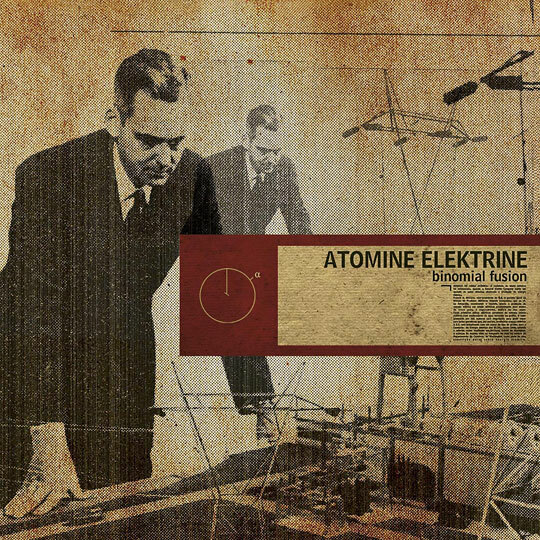 Experimenting with Atomine Elektrine since the early 90’s, the main influences to create this project came from the old krautrock school in its more cosmic and electronic side represented by artists like Klaus Schulze, Kraftwerk and even Neu!. However, incorporating ideas coming from various other sources, like the orchestral Cold Meat-ish trademark of the time and the sacral beauty of Raison D’être, Atomine Elektrine came out as a peculiar mutation of the kraut heroes; more rhythmic and a bit less experimental and far-out than expected. A new form of life. Labelled as ‘new-age-sacro-trance’ at the time, “Elemental Severance” actually shows a wide spectrum of electronic styles resulting in a hybrid, yet cohesive masterwork. From trancey rhythms and dreamy, sacral ambiences to occasional male/female choirs, melancholic melodies and well inserted samples. As if the imaginary past and present could touch each other, everything is involved by a majestic, unique surreal atmosphere, producing gorgeous sounds that leaves you truly mesmerized. Included here are 5 bonus tracks taken from the same recording sessions. The overall aura of “Elemental Severance” is also present on “Atom Xtension”, the disc 2 of the set. Recorded in two distinct periods of time, the first part has nearly the same succesful elements, albeit with a slightly more eclectic nature. Ambient beat driven soundscapes with layers of synth treatments fill the air on some tracks, while semi-dub, chill-out compositions take place towards the end of the disc. Both works were recovered and throughly remastered by Peter Andersson, making Binomial Fusion an unique document of this fantastic project. On his own words, “this material sounds now better than ever before”! 140 minutes of music, including 5 bonus tracks, housed in a gatefold digisleeve-like packaging plus mini-poster. Limited edition of 800 copies. - Disc 1 originally released as Elemental Severance on Cold Meat Industry, 1995 (except tracks 14-18, previously unreleased). - Disc 2 originally released as Atom Xtension on Yantra Atmospheres, 1998. Remixed and remastered by Peter Andersson.